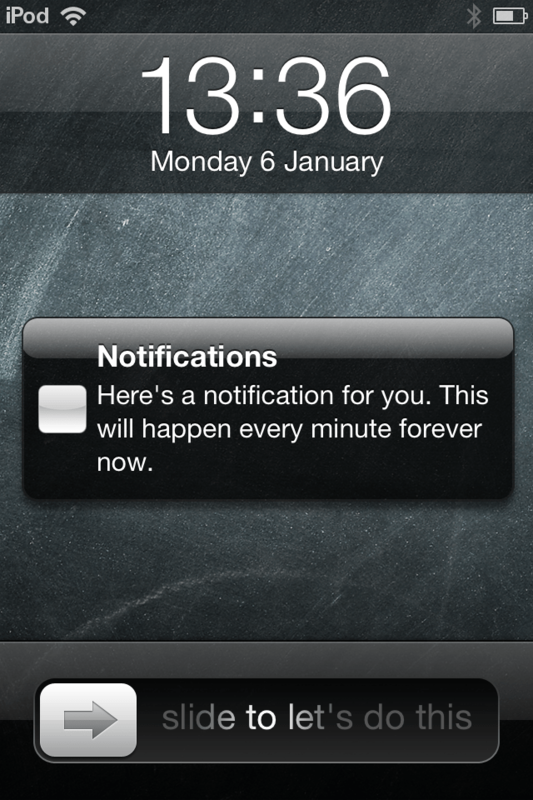 Now that we know how to create Local Notifications, let’s see how we can react to them. Say your app wasn’t running, and you wanted to know if it was launched as a result of a notification. In our AppDelegate we are passed a launchOptions dictionary, which will have a UIApplicationLaunchOptionsLocalNotificationKey option that will contain another dictionary we can give our notification. This probably sounds more complicated than it is… basically if this key is nil, then we were not launched as a result of a notification. If it’s not nil, it will contain options from the notification that launched it. Note that when the app is already running, the didFinishLaunching method is not called. So if the app was open in the background this approach won’t work. Note that this method will be called every time your app receives a notification, not just when it’s woken from the background.